When a buddy of mine planned a trip to Cincinnati that would involve a side-trip across the river to Liquor City Uncorked in Kentucky, he asked what, if anything, I'd like him to bring back. The simple, generic response is always, "Whatever I can't get here in Illinois." This time, however, my request was specific. I wanted to give Wilderness Trail a try. 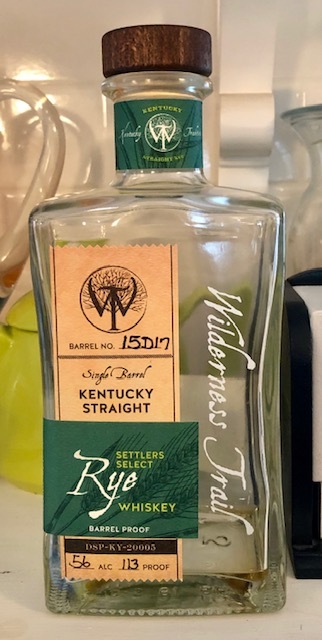 From the information I've gleaned, Wilderness Trail appears to be an up-and-coming craft distillery out of Kentucky, and the initial reviews are that, while their whiskey is still a bit young, it is nonetheless very good. In a way, the reviews I've been seeing reminded me of the kind of reception New Riff has been getting on their own distillate, so I was certainly intrigued. I was given the option of the bourbon or the rye, and I had to go with the rye to start. I am a sucker for barrel strength rye, after all. The nose gave some traditional rye whiskey notes immediately, making me like it from the start. At the forefront were notes of soft cinnamon, with only a mild bite to it, but the flavor of cinnamon was there. I also got that distinct pine note that I seem to only get in ryes. I did get some alcohol burn, but that's to be expected given the proof. Surprisingly, I also got a light woodiness, adding just a touch of bitterness to the nose. That bitterness was overwhelmed by the heavy dose of brown sugar, however, making this more sweet than spice, at least on the nose. The palate mostly followed suite. That brown sugar note was there and was heavy, seeming to dominate any other flavors that I was getting. It wasn't cloyingly sweet, but it had that distinct brown sugar sweetness to it throughout. Other notes were present, however, adding a touch of complexity to this rye. I got a little bit of the pine that I noticed on the nose, thought the flavor seemed to blend with an anise flavor as well, commingling into a sort of combination of the two. That combo flavor was layered over a vanilla cream flavor. All of these flavors combined went really well with the dominant brown sugar note. It also had an interesting twist in there somewhere. I got dark cherry notes, that added a bit of a fruity quality as well as a certain tartness. At times I would also get this warming amaretto flavor, reminding me of times spent drinking Disaronno in high school, but with a bit more subtlety and finesse, and a bit less regret the next morning. That brown sugar note at times was almost of a maple syrup quality. It added a certain "stickiness" to this rye. Perhaps that's why, despite the high ABV, I got very little alcohol hitting my tongue, making this a very drinkable yet relatively complex and heavy-duty rye. I really enjoyed this and was glad to have had the chance to try it. I hope that I start seeing it on shelves in my area in the very near future.